We want our patients to receive safe, high quality and sustainable health services. As with hospitals across the country, we are facing a number of challenges, which mean that our patients are not always receiving the safe, high quality NHS care and treatment they should expect. It is becoming more difficult to make sure that we have enough doctors, nurses and other healthcare staff to provide many of the same services, 24-hours a day, seven days a week at both our hospitals. A local and national shortage of doctors, nurses and other healthcare professionals has led to difficulties in recruiting. This has placed increasing pressure on our doctors and nurses and some have left to take up jobs at other hospitals where they can enjoy a better work/life balance. Some patients have to wait longer to see a doctor in an emergency or have had their operations cancelled due to an emergency admission. The existing model of A&Es is becoming outdated. At our two A&Es, we are treating patients with minor injuries, for example a sprained ankle, alongside those with a life-threatening illness, such as a stroke. Both our existing hospital sites were built many years ago and they no longer provide the modern environment for delivering high quality services that our patients rightly expect and need. There has never been a greater demand on the NHS. We are living longer and an increasing number of people have long term conditions such as diabetes or complex health needs that require regular hospital care. We also have to meet the future needs of a wide range of populations across Shropshire, Telford & Wrekin. For these reasons, staying as we are is simply not an option. the other hospital provides planned care services. Both hospitals would have an urgent care centre that is open 24 hours a day, seven days a week. It offers the best value for money over the long term. 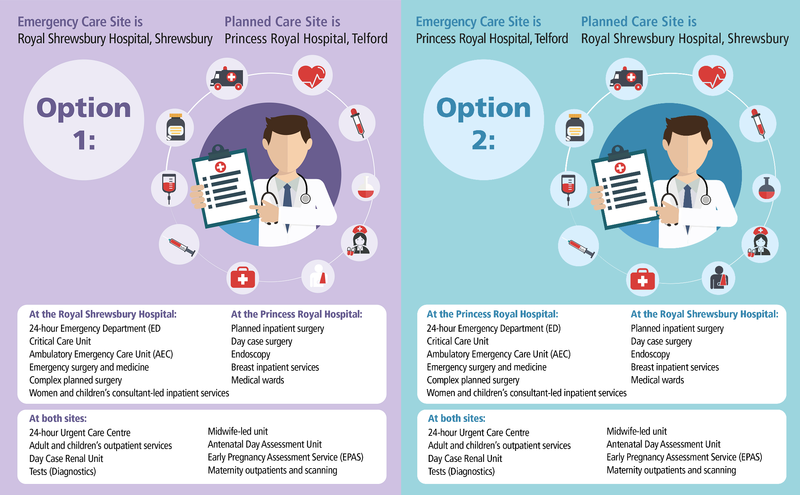 You can read more about the reasons why Option 1 is the preferred option, and what this would mean for you and your family, in our consultation documents. Although we have a preferred option, no final decision will be made until we have considered the views of everyone who responded to our consultation, which ran from 30 May to 11 September 2018. Find out more about our next steps.